The challenge #73 this fortnight at DS4J is to 'Make your own embellishments. Hoot Hoot! I decided to try quilling. I got a quilling book from amazon called Twirled Paper. Its so fun making them. The best investment if you want to try quilling is this hand Mini shredder .Use construction paper and let your kids have fun making the different shapes in the book. My son helped me making the owl and the heart. OMW I just adore your quilled owls. How clever are you! Everything just goes together so beautifully. Remember to win the challenge you need to complete the blog hop and comment on each team members' blog and be a follower. Beautiful Pam and those quilled owls are the cutest. Fabulous card Pam - love the quilling. WOW...Wonderful card. Thanks for joining Crafty Cardmakers' challenge. Lovely card and great quilling, Thanks for joining us at CCM. A lovely card and brilliant quilling. Love the quilling!! Thanks for entering our Anniversary Blog Hop and Anything Goes challenge at Created With Love Challenges. Remember to win the challenge you need to complete the blog hop and comment on each team members' blog and be a follower. Love the owls and the paper quilling...thanks for joining us here at SAS4K. Lovely and sweet card! Thanks for sharing with us at The Crazy Challenge and hope to see you again in our challenges. That turned out really nice! I am also pretty new to quilling and tried to use my paper cutter to make the strips ... let me tell you that the hand mini shredder you suggest is the better choice ... thank you! fab card and lovely quilling! Thanks for joining us this week at Created With Love Challenges for our ANYTHING GOES 1st Anniversary Blog Hop Challenge! I just love your quilling! Great balance in the design elements. Thanks for dropping this off by our house at 613 Avenue Create! We look forward to your next visit. Cute card! Thanks for joining us at Created With Love Challenges for our Anniversary Blog-Hop. Cute card! Love the quilled owls... Thanks for joining us at The Crazy Challenges. 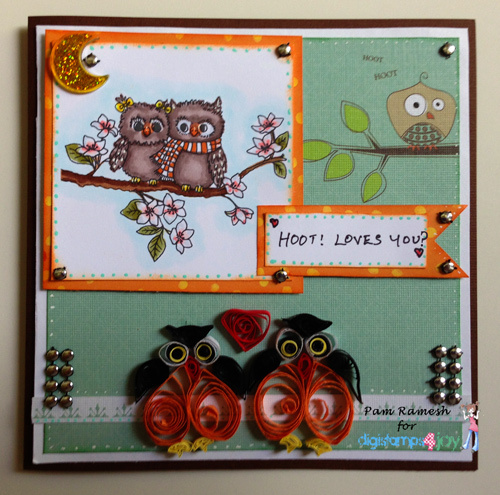 What an absolutely fabulous card, I love the owls and your quilling looks stunning.